Located in one of the most beautiful listed sites of France between Arles, Avignon and Saint-Rémy-de-Provence, this 17th Provencal farmhouse (former vaulted “relais”) boasts of an exceptional quiet location with views of the Château des Baux-de-Provence. Large lit garden with small refreshing falls, lit boules ground by night and vineyards belonging to the property. Around the blue mosaic pool, there are 2 solar tents to provide shade during your meals facing the hills with the song of the cicadas. 2 dining areas are at your disposal: a covered teak deck around the pool and a stone area under the pine trees in the large lit Provencal terraced garden. There is a Weber Premium gas barbecue and the outdoor deckchairs with mattress are waiting for you. The heated pool and the farmhouse are maintained by a devoted team. There is a private dead end reserved to the several impressive farmhouses of Le Vallon and a beautiful emerald green lake. The minimum rent is 2 weeks. Special conditions for long term rentals in winter for retired persons. This farmhouse is exceptionally located on the listed site of Les Baux-de-Provence. Many stars and authors including Frederic Mistral found refuge there and left many signs of their passage. It is completely quiet yet very close to the village of Maussane-les-Alpilles where you will find shopping and medical centres as well as many small typical restaurants in the village and the square (outdoor restaurants with automatic mist sprayer) where you can see artists and famous television presenters that often have a house in the surroundings. For gastronomy lovers, the 2 or 3 best restaurants of France are in Les Baux: La Baumanière, La Cabro d'Or, La Régalido, etc. For golfers, the wonderful 18-hole golf course of Les Baux is 500 m and the golf of Mouriès is a few minutes as are the beautiful cliffs for climbing. The fishing lovers will be delighted along the banks of the canal of the valley of Les Baux close to the village of Maussane-les-Alpilles. You can do multiple day trips and in 2 weeks you won’t have time to visit everything. The old village of Les Baux is a must-see with its narrow streets, its several workshops, its museums, its castles and its many different shows such as concerts and exhibitions in the decor of the old Carrieres which are idyllic. In less than 10 minutes, you can reach Fontvieille, Arles or Saint-Rémy-de-Provence. A bit further, you are in the Luberon or in Saintes-Maries-de-la-Mer with many horse rides available through the herds of horses, ponds overflown by flamingos and beaches ideal to swim in the Mediterranean Sea. A few metres from the farmhouse, you will find several famous wine and olive growing estates (Mas de la Dame, Sainte-Berthe, Castelas, etc.) where you can buy white wine, rosé, red wine and olive oil. A delight for your meals in La Voûte. Hello, I want to introduce myself in order to reassure you about the seriousness of this rental in this idyllic place of Les Baux-de-Provence with which I fell in love. Retired, but still active, I’ve always worked in tourism. For many years, I’ve been a member of the Tourism Great Council after being co-founder of the Professional Union of Travel Agencies. Currently president of the Lions Club JSP and manager of the Royal Society UBJET that unites Tourist Journalists and Writers. Initiator of the twining of Brussels Golf Club and Les Baux-de-Provence Golf. My passion for cinema as a film maker allowed me to discover this enchanting site where is set “La Voûte 1667” where, as would say Charles Baudelaire in “Invitation to the Voyage”: “There all is order and beauty, luxury, peace, and pleasure”. A promising introduction! To let you enjoy this enchanting site. The place, the central location to discover the richness of Provence, the kindness of Provencal inhabitants, the quietness while being close to the tourist activities of the village of Maussane-les-Alpilles and the old village of Les Baux that is classified most beautiful village of France. There is a bathroom with Italian mosaic equipped with a large bath with shower, a large washbasin, a toilet and a bidet. One of the bedrooms on the ground floor has a shower room with washbasin and a splendid walk-in shower. There is a second separate toilet in the corridor. The farmhouse is also watched by a security company and has “faintness” equipment that you can activate in a reasonable distance all over the property in case of medical problem. The farmhouse has ADSL Wi-Fi Internet. A Really Good Week In France! Thoroughly enjoyed our stay - the facilities are good and beds very comfortable. TV has a few English channels but a DVD player may be an enhancement in the event of a rainy day. Arrival greeting very good. Pool excellent and literally 3 steps from the door! Enjoyed touring the locality. Supermarket a bit of a trek but easily manageable and Maussane Les Alpilles (next village) delightful with decent shops, cafes and restaurants - St Remy de Provence (other nearby town) also very good but a bit more crowded than Maussane. Not a single feral cat in sight!! I booked the property for a group of 5 people, to follow a week in Paris, but unfortunately my husband and I had to return home a week early for medical reasons, and so the three others stayed in the property. This review of the property is based on their reports to me. They reported that the property was very nice and beautifully situated in the countryside with friendly neighbors and a courteous local contact (Diane). The house has most of the amenities one would want--wifi, full kitchen, heated pool and grill, air conditioning, etc., and so it was conducive to having a pleasant stay. The pool was especially enjoyable. Nevertheless, a few things about the property must be mentioned: 1) The old (17th century?) part of the house is unpleasantly musty, and this is only relieved by leaving the windows open all the time. 2) The neighborhood is home to a horde of feral cats who invade the house at any opportunity. On the first day when everyone left to go touring, the cats found their way into the house by pushing through the screens.. They went throughout the house, and also made a mess of the kitchen garbage. The only way to keep the cats out was to have the windows and doors closed at all times, not the best situation if you want to enjoy the fresh air and wanted to combat the mustiness. 3) The house is not an unattached single family residence but is attached to another residence. That said, the neighbors were terrific and very helpful. Thank you for your review. We sincerely appreciate your taking time to provide your comments. It is a real shame you could not make it to arrive at our beautiful mas! We constantly do our best to please our guests and try to improve year after year their stay. We normally do not work with credit cards as it is indicated on the page of our rental.Maybe their was a confusion on the website announcement. We will maybe soon decide to accept credit cards for the future. We deeply apologize for the inconvenience caused by these cats, we were not aware at that time of their presence but the problem has been solved the week after the departure of your friends as I am the owner of the near second residence and have very strict rules for our tenants.They left the place for good! I like to remember that the second residence you’re talking about is clearly separated from the mas and both enjoy their own private areas,they are opposite and do not look in the same direction and do not interfere at all, moreover it is a yearly rental,rented now by a very nice couple who will be pleased to help in any case. it has been always appreciated by our guests. For what concerns the musty atmosphere in the living room we never received any complaints about that as it is the historical part of the house, an authentic completely refreshed XVIIth century arched living room built only with natural stones from Les Baux de Provence’s ancient stones quarry, so it is supposed to be nice and fresh all year long and even more enjoyable in the winter time thanks to the fireplace.We really do not know what could have happened to make it unpleasant so we are really sorry about that.Our latest guests did not notice anything wrong. Nonetheless, we installed now new mosquito nets in the living room to give our guests the possibility to enjoy day and night the provençal natural scents coming from the gardens,surrounding hills and olive trees fields without being annoyed. We wish you all the best and really hope to welcome you back one day in one of the most beautiful region of southern France. Calme et confortable mas avec superbe vue! Séjour d’une semaine très agréable dans cette propriété chargée d’histoire. Le mas est charmant, parfaitement entretenu, ainsi que la piscine. Nous avons apprécié le calme de l’environnement et la superbe vue sur le château des Baux. La climatisation dans les chambres est vraiment très appréciable. Le propriétaire est attentif à ses hôtes et c’est à saluer! Nous n’hesiterons pas à revenir à La Voûte ! En cas de problème (ce qui est rare) ou de souhaits de la part du vacancier, je me mets toujours un point d'honneur à toujours y répondre le plus rapidement possible afin de procurer le maximum de bien-être au locataire. Ceci grâce aussi à une équipe de professionnels sur place sur qui je puis compter. Encore un grand merci pour votre appréciation qui récompense tous nos efforts pour la mériter. This is a very cozy and well equipped house with beautiful gardens! We especially enjoyed the incredible sunsets over the Chateau Les Baux. In the garden and around the pool you find several seating areas for every time of the day, and we took advantage of the Petanque as well as of the great barbecue. The owner is very friendly and helpful. We had a lovely week! Ce Mas, véritable Âme au sein d'un site paradisiaque, nous a permis de passer 15 jours de bonheur et de paix totale. Notre fils et son ami, 15 ans, ont également apprécié ce site incroyable et ont grandement profité de la superbe piscine. En cas de besoin, Carine (voire son époux), répond extrêmement gentiment à tout besoin ou demande. Les personnes en charge de la piscine et du jardin ont été également d'une grande gentillesse. Concernant le Mas, tous les équipements nécessaires sont présents et la clim dans les chambres est très appréciable. Le salle voûtée et l'ensemble transpirent la tradition et l'histoire. En conclusion... nous reviendrons !!! afin que nos locataires soient assurés de passer un excellent séjour dans ce mas idyllique. Même n'étant pas personnellement sur place nous veillons à tout moment à la sérénité de nos hôtes. j'espère que l'installation d'un home cinéma grand écran vos aura particulièrement fait plaisir. Nous sommes arrivés dans cet endroit de rêve, très calme, à l'abri des regards avec une piscine magnifique très bien entretenue. La vue est à 360° et on peut voir Les Baux de Provence qui s'élancent dans le ciel. L'eau avait 29 degrés, un vrai bonheur! La maison est très agréable et nous avons eu un vrai coup de coeur pour le salon avec ses pierres du pays. On a pu profiter des 2 terrasses, bien orientées. Les lits sont très confortables. De la maison, on peut facilement visiter de nombreux sites: Saint-Remy de Provence, Arles, Isle sur le Sorgue, Avignon, Saintes Marie de la mer,... Un petit plus non négligeable, le propriétaire est charmant et très disponible! qu'il faut tout faire pour leur assurer une réussite parfaite. The wonderful Les Baux-de-Provence Golf as well as the best restaurants of France (L' Oustau de Baumaniere, La Cabro d'Or, La Benvengudo, etc.) are a few minutes from the property as the old village of Les Baux, the Cathédrale d’Images with its many shows, Val d’Enfer and the many famous wine and olive growing estates that produce remarkable wines (white, rosé and red wine) and olive oils. The village of Maussane-les-Alpilles with its square, its many establishments appreciated by many cinema and television stars and its shopping and medical centres is 900 m. The national police force is located on the main road 500 m from the property. 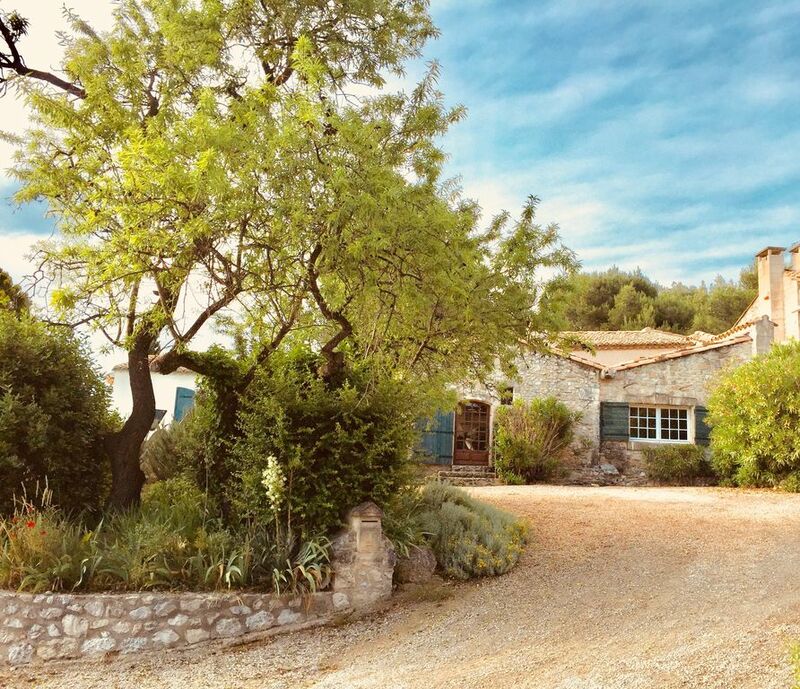 The Provencal farmhouse is centrally located so that you can enjoy beautiful day trips in Arles, Saintes-Maries-de-la-Mer, Saint-Rémy-de-Provence and its Glanum, the Vaucluse Fountain, the Camargue, etc. Other activities: strolls in the Chaîne des Alpilles. Golf: several nearby golf courses. 500 m: wonderful Les Baux-de-Provence Golf twinned with the Brussels Golf Club. In Mouriès: the Servannes Golf. La période minimum de location concernant ces prix est de 1 semaine. Cependant il est toujours possible d'envisager une durée différente suivant les disponibilités. Pour un forfait pour les mois d'hiver il est possible d'obtenir d'excellentes conditions. Les charges normales sont comprises (eau, gaz, électricité*, entretien du mas et de la piscine), à l'exception des communications téléphoniques si téléphone du mas employé. Relevé par la firme Orange. Si consommation électrique dépasse très largement la normale (ex. illumination du mas, jardin, cascade, ... jour et nuit) le propriétaire se réserve le droit de vous faire payer le surplus de la normale ) Electricité relevée par compteur de la Régie EDF (maximum 75€) +Une caution de 500€ sera à verser .